A bowl of risotto on a chilly rainy night is so warming. Since I love mushrooms and peas and had both on hand I decided to put them together in this dish and it came out beautifully! I used Shitake but you could easily sub with Porcini too. The bit of white wine adds an extra layer of flavor, as does the broth since the dried mushrooms are reconstituted in it and then added to the risotto to cook it. You could serve this either as an appetizer or as a main course, depending on the portion size. It doubles easily. 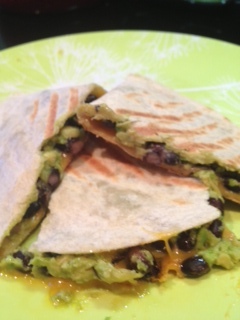 The recipe below made 2 main course servings or 4-6 appetizer servings. In a medium-sized sauce pan bring the broth to a simmer over medium heat and add the mushrooms. Cover and cook until the mushrooms are tender-about 5 minutes. Using a spider remove the mushrooms, shaking off the liquid, to a board and chop roughly to desired size. Keeping the broth in the pan over low heat, add the wine and brandy. Melt the butter in another large heavy-bottomed saucepan over medium heat. Add the onions and saute until soft. Add a bit of the broth, the mushrooms and garlic and sautee until the mushrooms are tender and the liquid has evaporated. Add the rice and 1 cup of broth and simmer over medium heat, stirring often, until nearly all of the liquid is absorbed. Repeat the process until the rice is tender and creamy about 30 minutes. Add the tbsp of butter and stir. Mix in the peas and the Parmesan cheese and then add the salt and pepper to taste and serve. Note: an easy way to defrost the peas: place one small bowl (large enough to hold all of the peas and room enough to stir them) into another larger bowl. Pour hot water into the larger bowl so that it surrounds the peas. Stir occasionally. They will defrost in the time it takes to make the risotto above. For the Parmesan cheese use only freshly grated from a block. A microplane works the best for the finest grate. I LOVE this dish! After years of trying to find an eggplant parm recipie that wasn’t totally slathered in sauce/fried etc… I created this one. I love eggplant and this one totally lets the eggplant shine-the texture, the taste-it’s not mushy, it’s not bitter-it’s just right. The beauty of this dish is the feeling the texture of the eggplant, the melted cheese and pieces of tomato in the marinara sauce. 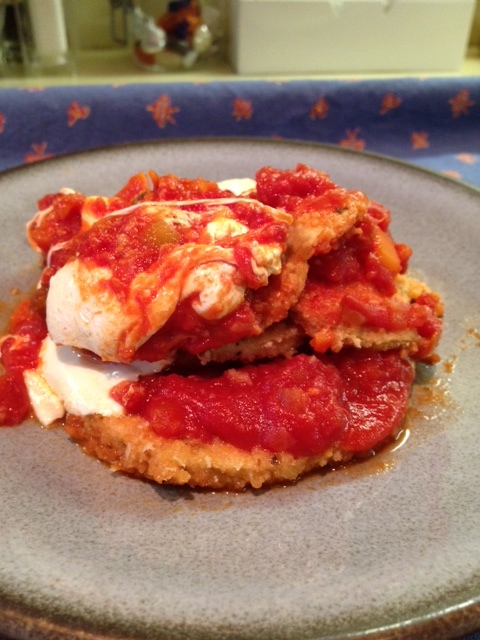 This dish is not a typical eggplant parm as the eggplant is baked instead of fried-saving a ton of calories. Since there are so few ingredients use the best quality and freshest ingredients possible. This is the time to splurge on the San Marzano tomatoes for the sauce and a gorgeous ball of hand-made, super fresh mozzarella and wedge of parmesan. This dish is not one drowned in sauce or cheese (you can add more if you like) but I find that using less keeps the eggplant from becoming mushy. Enjoy!! Pre-heat oven to 350. Coat 9×13 baking dish with cooking spray. Set aside. Combine breadcrumbs, 1 tbsp of parmesan, Italian seasoning and garlic powder in a shallow dish. Place egg whites in another shallow dish. Servings: 6 Prep Time: 30 minutes Cook time 35-45 minutes total.